Love at first bite! 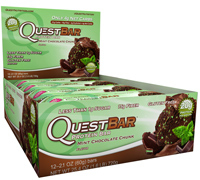 Irresistible mint and decadent chocolate finally meet in the latest protein-packed Quest Bar! With no added sugar and 20g of protein, this double-dose of deliciousness is a #CheatClean delight! Protein Blend (Milk Protein Isolate, Whey Protein Isolate), Soluble Corn Fiber (Prebiotic Fiber), Water, Almonds, Cocoa Butter, Cocoa (Processed with Alkali), Natural Flavors, Erythritol, Palm Oil, Dextrin, Sea Salt, Sunflower Lecithin, Sucralose, Color (Fruit Juice, Turmeric), Coconut Oil, Xanthan Gum, Baking Soda, Peppermint Oil, Steviol Glycosides (Stevia). CONTAINS: Almonds, Coconut and Milk-Derived Ingredients.